When precision engineering comes to mind, your thoughts might race down I-26 to the BMW plant in Greer, South Carolina. But closer to home, in Fletcher, the same caliber of design is applied to a different kind of transport. 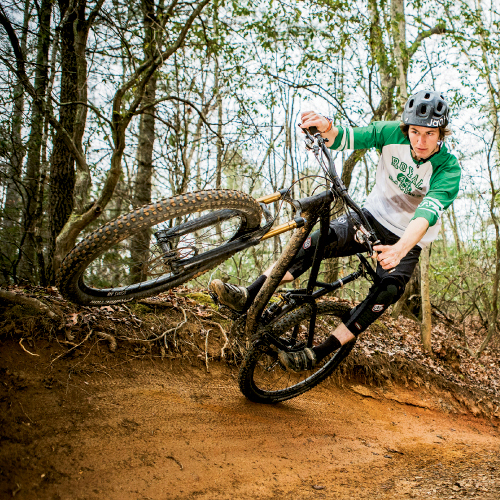 You could say Cane Creek Cycling Components makes parts for the BMWs of the bike world, and its proving ground is the trail rather than the track. Cane Creek has something of an unusual backstory: In the early 1970s, Japanese company Dia-Compe opened a bike parts factory in Fletcher because it was a central East Coast location, convenient to the major U.S. bike manufacturers at the time. In 1991, the factory’s employees bought it out and changed the brand name, and soon after, the company made important advancements in bike suspension. Cane Creek patented a design for a threadless headset—a key set of bicycle components that helps the front wheel rotate—which revolutionized cycling, says Holly Colson, the company’s director of marketing. Named the Aheadset, this equipment makes it possible for bikes to be lighter, stronger, more adaptable, and easier to steer. The company also improved shock absorption technology by borrowing ideas from motor sports and applying them to bikes. Early on, Colson says, Cane Creek decided to make only top-of-the-market components, and its hundreds of parts can often be found on bikes that run in the $6,000 to $10,000 range. Europe—particularly Germany, where meticulous engineering is strongly valued—is the leading market for Cane Creek. (Later this year, high-performance Ghost bikes from Germany, outfitted with the company’s components, will be available in the U.S. at REI stores.) But Cane Creek components aren’t just for bikes used by elite athletes; all sorts of riders use the company’s cantilever brakes and brake levers on their time trial, road, flatbar, and cyclocross bikes. Cane Creek has a new CEO, David Hall (formerly the company’s director of operations), recently added its 50th employee, and plans to double its workforce over the next four years. Last year, the company was named one of Outside magazine’s Top 100 Best Places to Work in recognition of its distinct culture, which includes daily bike rides at lunch and opportunities to test new products out on the many local trails. “We tend to attract people who are passionate about cycling,” says Colson. The right people, place, and products seem to be the winning formula for a manufacturer in the mountains that has beaten the odds and continues to thrive.